If you have followed Professional Cycling in the US for any length of time, you have heard about “Philly” and “the Wall”. After running the last 28 years, the race was nearly discontinued for 2013. However, promoters came through with a last minute sponsor and the race was back on, albeit in a slightly different iteration from its original format. But the heart of the race remained, the grueling 17% grade Manayunk Wall. It would also provide a new and exciting finish as the winner would be crowned on the final ascent at the top. A large international field of 194 riders from 14 professional teams (four UCI Pro Continental and 10 UCI Continental) plus 11 elite amateur squads lined up to compete for the $30,000 prize purse. The teams included UnitedHealthcare Pro Cycling, Novo Nordisk and Stage 17-Cylance, a development cycling team for cyclists between the ages of 18-25, based in Southern California. The men would complete 10 laps on the 12-mile circuit, and the finish would be atop the famous 17% Manayunk Wall. Race winner American Kiel Reijnen (UnitedHealthcare Pro Cycling), 16th place Type 1 diabetic Martijn Verschoor (Novo Nordisk) from Holland and 19-year old American Ian Moore (Stage 17-Cylance) provided their race data for comparison. Comparing the 3 race files, not only can we look at what it will take a U23 development rider like Stage 17’s Ian Moore to get to the next level and race on a professional team such as Novo Nordisk or UnitedHealthcare, but we can also see what it took to win one of the largest races in North America. The three teams all had specific plans going into the race. UnitedHealthcare and Stage 17 executed as planned and Team Novo Nordisk had to adjust on the fly but was still able to finish the race successfully. 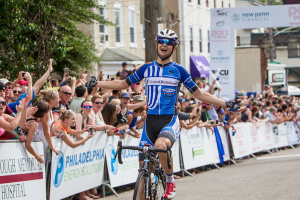 For Reijnen and his UnitedHealthcare team, there was only one goal: to win the race. Mission accomplished. Reijnen was on peak form after a mechanical mishap in the closing meters of last week’s US Pro Championships in Chattanooga, TN, potentially cost him the win (he still finished 3rd within a bike throw of the victory). So, he was hungry and motivated to win Philly. He was patient throughout the race, showing his experience by conserving energy for the final assault on the Manayunk Wall, when he jumped clear at the base of the climb and finished several seconds ahead of the second placed rider, putting out his 60-second peak power for the race – an astonishing 11.3 w/kg! Reijnen was quick to credit his teammates for the win saying, “Cycling is a team sport and I have some of the best teammates around on UHC. The boys have turned themselves inside out so that I could have a shot in the finish of these races.” Reijnen was protected through much of the race by his teammates, and this allowed him to conserve energy for the last lap and that explosive winning move. We can see how much he conserved compared to Verschoor and Moore by comparing their Training Stress Scores® (TSS®). TSS is a measurement of the workload performed during a race or ride based on the duration and intensity of an effort, relative to a rider’s functional threshold power (FTP). FTP is the highest average wattage a rider can generate during a 1-hour maximum effort, and is often a baseline measurement for strength and fitness. Just looking at watts per kilogram or average power during the race will not give us accurate information as it appears as though Verschoor put out the least watts per kg at 2.9 and Moore and Reijnen both averaged 3.7, yet their results don’t line up in that order. Considering that all three riders have different threshold levels paints a more complete picture. The Philly Classic was Stage 17-Cylance’s 2nd UCI race of the year and their first ever one-day Classic. According to Stage 17’s director Michael Roecklin, “the goal was to make as much noise as possible, to animate the race, to repay the promoter’s faith in the team, and to have fun.” It is clear that Moore followed instructions, as he did work very hard as indicated by his high TSS for the 85 miles of the race that were captured on his device. 100 TSS is equivalent to a 1-hour, all-out TT effort. For Moore to have a TSS of 293 in 3 and a half hours tells us that he was riding close to threshold for the entire 3 and a half hours. Once again, Philly did not disappoint, providing fans with a thrilling sprint finish up the Wall. Reijnen overcame the frustration from the week before and delivered a well deserved win. Team Novo Nordisk suffered bad luck but was still able to salvage a 16th place finish despite a losing a teammate to sickness. At only 19 years of age, Ian Moore has just raced one of the most well known races in North America. With the ability to gain so much valuable experience so early in his career and demonstrating clear ability, look for Ian to do some good things in pro cycling in the coming years.